Gadgets aren’t just about the latest Apple device. Beauty has its very own advancing technology, and there’s some pretty exciting gadgets emerging now. Not nearly enough technology is devoted to having fab lips (no pun intended), but this tool ($48, blissworld.com) may be a godsend for any among us who need some help scoring beautiful lips. 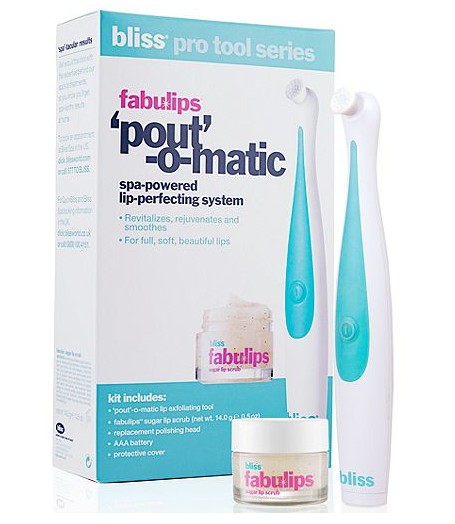 This pro-powered lip-perfecting device uses gentle rotation and a custom-designed head with massaging nubs to softly yet effectively stimulate and exfoliate your pair, buffing away flakiness and dryness. It’s a scientific fact that we are prettier when we get sufficient sleep. The Wake-up Light ($170, drugstore.c0m) gradually eases you out of bed for a more relaxing and natural wake-up by using simulated sunlight and sounds, beginning thirty minutes from your designated wake-up. The result is more energy and productivity, and, more importantly, more rested glowing skin. The launch of this device ($495, triaBeauty.com) in February will round out the Tria light-based product assortment (currently consisting of hair removal and acne treatments) as it makes its foray into the world of anti-aging. It is the first at-home non-ablative fractional laser to hit the market. Turn back the clock, you say? We’re so into it. Minds (and fat!) will be blown over by this uniquely designed neoprene wrap with special cold packs users wear at home for 30 minutes per day to lose unwanted fat on target areas. Not exactly a gadget, but if this technology ($50, mycoolslim.com) works, we’re ready to give it every award ever. The sun is no joke, and this new device by Netatmo ($99, netatmo.com) is a wearable UV exposure monitoring tool. The device is a bracelet with a jewel sensor, designed by Camille Toupet, which pairs with an iOS device and monitors levels of sun exposure. The app that syncs with it alerts wearers of excessive sun exposure, tracks daily habits and features personalized coaching and recommendations to help women take better care of their skin. We tried this out at this year’s Consumer Electronics Show, and it’s mega cool. The device ($180, panasonic.com) captures moisture from damp hair and surrounding air and infuses it back into the hair with nanoe ions. Normally, we’re petrified of any device that uses “hair” and “moisture” in the same sentence, but this baby actually helps our hair to dry faster and stay frizz-free by hydrating the hair and scalp from the inside out. As nature intended. Read more: Do At-Home Beauty Devices Really Work?